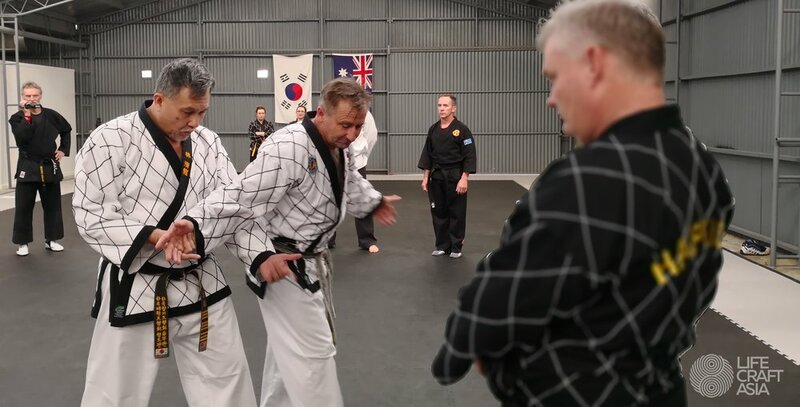 LifeCraft Asia — World launch of Korean Hosinsul | Hapkido program in AUSTRALIA. Off to UNITED KINGDOM soon. Korean Hosinsul (Applied Self-Defense) technical and instructor program under the International Hosinsul Federation (IHF). Korean Hapkido technical and instructor program under the Korea KiDo Association (KIDO). This 23th-26th June 2018 the launch of a global ground breaking initiative for the promotion of genuine Korean Martial Arts (KMA) in BENDIGO - VICTORIA, AUSTRALIA. With the full sanction and blessings of the International HoSinSul Federation (IHF) and the Korea KiDo Association (KiDo), LifeCraft Asia managed a 40 hour 4 day integrated workshop that promoted both HoSinSul (Korean Applied Self-Defense) and HapKiDo (Way of Coordinated Power). Testimonial from one of the participant ‘Master Brett Austin’. The workshops were opened to experienced martial artists from any art or style, with an even mix between coloured belts, lower Dans and senior Dans (5 th Dan and above). The predominant art attending was World Taekwondo (WT). The first 2 days saw the introduction of benchmarked concepts and executions of HoSinSul (HSS). HSS can be seen as the distilled version of practical and efficient self defense, Korean style. This has come about due to a global growth of interest in this core aspect of most martial arts, which have over the years gravitated more towards sports. HSS concepts covered 3 main types of HSS: TaeKwon HSS; KukKi HSS; and HapKi HSS. The following 2 days saw the follow-on promotion of HapKiDo (HKD) with emphasis on how the Hosinsul (HSS) techniques could be morphed and then flowed into mainstream HKD. The HKD promoted was based on 3 of the 4 historically largest and most significant HKD associations in Korea: KiDo; KHA; KHF. Sessions included lectures based on background, evolution and current progress of the leading HoSinSul and HapKiDo associations in Korea; fundamental concepts, executions and revisions. (Left) Grandmaster Phillip Monaghan, (Middle) Master David Atkinson, (Right) Master Brett Austin. Those Dan holders that were interested and deemed pre-qualified via experience, current accepted Martial Art rank and relevant knowledge were assessed for their respective Dan rank and Instructor and Deputy Instructor (SaBumNim and BuSaBumNin) qualification. Assessment consisted of physical testing, comprehensive questionaires and a brief character assessment. Certification could be applied from the Korean Martial Arts South East Asia Pacific (KOMA SEAPAC) and the respective Korean governing bodies: Korea KiDo Association (KIDO) and International HoSinSul Federation (IHF). For those who passed and requested KOMA papers first, these were processed and issued on site. All KOMA papers carry 1 to 1 accreditation with the respective Korean bodies. This program is fully endorsed and sanctioned by both the International HoSinSul Federation (IHF)국제호신술연합회 and Korea KiDo Association (KiDo)대한기도회 (합기도). Participants are exposed to benchmarked levels of HoSinSul (HSS) and HapKiDo (HKD) from the previous Korea Hapkido Association (KHA), current Korea KiDo Association (KIDO), Korea Hapkido Federation (KHF), and International Hapkido Federation (IHF). Qualified senior participants can elect to sit for Dan and Instructor qualification (additional requirements and checks are required for HKD assessment). Graduates have the opportunity to have a direct link and linage with the IHF and KiDo. HoSinSul graduates can elect to promote their own “blend” of HoSinSul with the full recognition of the International Hapkido Federation (IHF). HapKiDo graduates will have similar benefits with the Korea KiDo Association (KIDO). All courses were either given directly or supervised by Grand Master LTC J. S. LIM who is certified by the leading Korean MA associations: KIDO; KHA; KHF; IHF; Korea TukKong MooSool Association (Korea Special Forces); Kukkiwon; Taekwondo Chung Do Kwan. In this coming November 2018 A HoSinSul | Hapkido Open Technical Workshop and Instructor Seminar will held in London - United Kingdom.